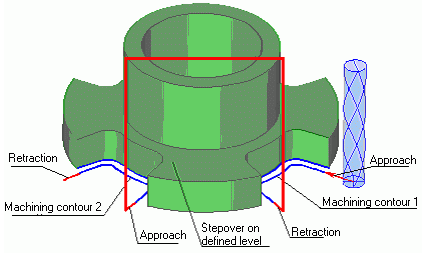 <Tool stepover> is a tool movement between the contours being machined. 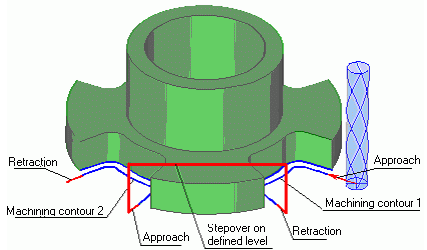 One should not mistake it with the machining term <Stepover>. 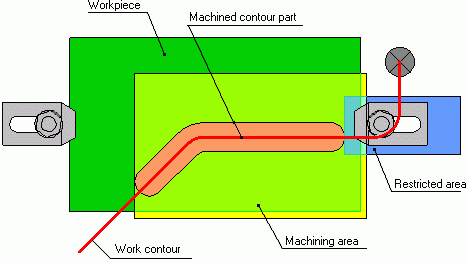 If the model is machined using one tool, and the machining toolpath represents by itself a tool transition along several contours, then it is necessary to create machining conditions for the transition from one contour to another. Because the stepover methods <On surface> and with <Retract-approach> are the optimal only with the short length stepover, if it is necessary to perform a stepover of a longer length, then regardless of the defined stepover type, the system will automatically generate a stepover via the safe plane. If on the machining <Strategy> page, the user does not activate the Idling minimization mode, then the contour machining order will be defined by the order in which the contours are located in the list of the <Model> page. 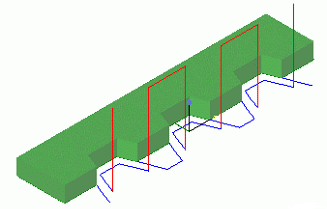 To define an optimized sequence of contour machining using the minimum length of idle moves, the user should select Idling minimization mode on the machining <Strategy> page. SprutCAM in the 2D machining mode allows the user to work either using or not using a workpiece. If a workpiece is not used, then the stepovers between work contours will be performed either by the safe plane, or at the defined Z level. Using a workpiece will provide a safer work mode because the system will automatically create a stepover toolpath with control of tool collision with the workpiece, also in this case, SprutCAM will give the user more possibilities to optimize the machining toolpath. 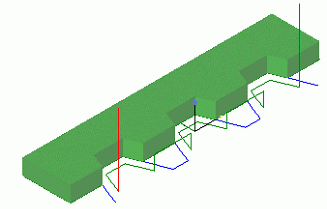 The workpiece can be defined on the <Model> page. For a complete description on how to create a workpiece, refer Workpiece. This method is the most frequently used one; but it is not the optimum relative to the machining complexity. The safe level can be assigned in the <Operation parameters> window on the <Parameters> page. Stepover is normally performed at the rapid feed (G00). The plane level for transitions can be assigned on the machining <Strategy> page relative to the zero of the current coordinate system. The toolpath will be created using the shortest route around the workpiece profile on the plane of the work contours location. To assign the feed, in the <Feedrate> page the user should choose the Feed to next mode and in the feed value assignment window define the required value. The workpiece must be defined. The stepover toolpath depends on the workpiece shape and will be formed as a curve around the workpiece area that is found. 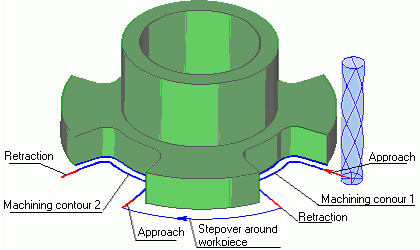 The shape of the stepover curve is also affected by the distance from the workpiece to retraction and approach points to contours. 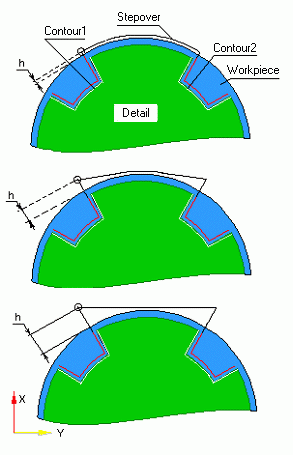 An example of toolpath alteration, depending on the value of that figure (h) is shown in these pictures. The toolpath can change its look from a straight line to the curve that repeats the shape of the workpiece as shown on the picture. Concave areas of the workpiece pass along the shortest curve, convex – along the rounding one. The stepover curve is constructed touching the edge of the tool against the workpiece, therefore in practice, when assigning a workpiece; the user should add an additional stock to the workpiece on the <Model> page. In order to obtain the desired stepover curve the user should use different values of h for the approach and retraction points, and also alter the workpiece profile. One should pay special attention to the case where the contour has areas that go beyond the workpiece area. In SprutCAM there is a rule – if a workpiece has been defined, the machining toolpath will be formed within the workpiece area only. If machining and restricted areas have also been defined, then the toolpath will be formed within the workpiece area, inside the available machining areas and outside the restricted areas (see pic. ).